My go-to lunch is a chunk of meat cooked up with some vegetables on the stove. At the moment, however, we are deep into summer and I really havent been feeling like pushing food around over a hot stove at noon. Furthermore, It is not always convenient to be home at lunch time. If youve been eating primal for any length of time I am sure you have come to know the elusive nature of the on-the-go lunch in a life without grains. Sometimes a sandwich would be really handy, and I dont mean one where a big saggy piece of lettuce is the bread because thats just depressing. 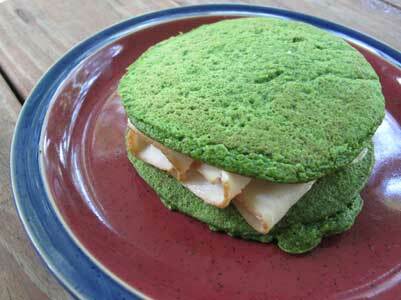 I came to learn of the green eggs and ham sandwich from Krista Schauss blog. Krista is an amazing individual. In addition to being an ex-police officer, she is BOTH a competitive bodybuilder and powerlifter from Toronto. (By the way, anyone else notice there seems to be a disproportionate number of people from Toronto with strength training websites and blogs Why is that. She is owner of Defining Edge Fitness which offers an intriguing service called Biosignature Assessment. Apparently they can analyze your hormone levels and make individualized training and nutrition recommendations based on the results. Anyway, Kristas recipe calls for oats. I substituted shredded coconut as a thickener and then threw in cup of raw almonds for good measure. The result is a substantial bread-like patty that holds together really well. You can easily whip up a batch of these in the morning or on the weekend. This recipe will make 6 pancakes enough for 3 sandwiches. My kids will actually eat these hot of the skillet as if they were regular pancakes if I put some maple syrup on them! You can also make a big batch and keep these in a plastic baggie in the fridge. Use them for sandwiches, hamburgers, or even just as a convenient snack. I havent tried this yet but I think theyd be fabulous with just a little almond butter spread on top. This recipe makes approximately 6 ‘pancakes’ – enough for 3 sandwiches. Combine all ingredients in a blender and blend until smooth. Allow the mixture to sit for about 10 minutes to thicken. Lightly spray a nonstick pan with grapeseed oil spray (you could also use butter or coconut oil. Pour enough batter onto the skillet to make a pancake that is roughly 5 inches in diameter. Depending on the size of your pan, you may be able to cook more than one at a time. Cook over medium heat until firm enough to flip (about a minute and a half. Flip and cook until cooked through. My turkey and brie sandwich. Welcome back. Hope you’ll be able to stay with us during the upcoming busy year, and good luck with the studies. 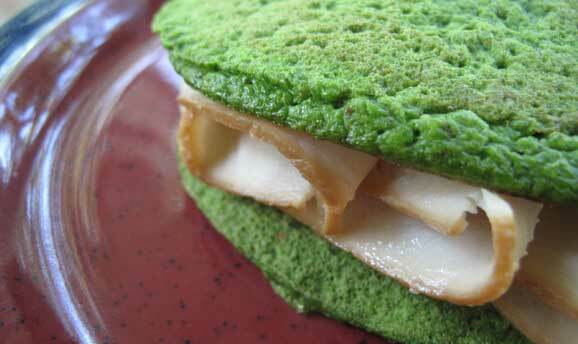 The green egg “pancake” sounds interesting and I’ll try it this weekend. Regarding your kids liking it with maple syrup, I think kids will eat most anything if you put maple syrup on it! I like this idea. I’ve been making “crepes” with 2 eggs and 1 TBS of coconut flour and they have a nice consistency; I was thinking about doing wraps with them. 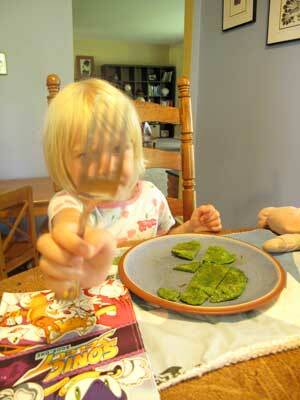 I’ll throw some spinach in the mix now too – good to know they keep in the fridge, I hadn’t tried it yet. I love this idea. While I don’t follow a strict primal diet, I am gluten-free and have discovered how much healthier I feel with a reduction in my grains consumption overall. I’m really interested in this idea! Thanks Bob. If only they would eat anything with maple syrup! Would make my life a little easier some days. Sarah – the crepes sound good. I will have to give that a shot. Seems like if they were thin they might fall apart but I guess not? Alta – I have the same experience. Reducing grains makes me feel much better and gives me a lot more energy. One thing I really love about the whole primal perspective is that it really isn’t necessary to get all strict with yourself and go 100%. Do what works for you and makes you feel good. Very excited to try this! I know exactly how you feel about slaving over a hot stove in the humidity. I had to laugh about your Toronto reference; I’ve noticed that too (I’m also from Toronto). Which of our Paleo ancestors first decided to drill a hole in a maple tree to get at the syrup? Must have really been sick of getting stung by all those bees while trying to harvest honey! I made these this morning with the intentions of using them as sandwich ‘material’, but the family got a hold of them and put maple syrup all over them:) My kids said they were ok, but in my book with kids ok is great!! At least I knew they were getting protein, Iron, and healthy fats at the beginning of their day. Thank you so much for your creative recipes! I made 2 pans of the pumpkin brownies and the family ate both pans by the next day YIKES!!! I’ve been making something similar for a while now. I took the pancake recipe from “Everyday Gluten Free Gourmet” and simply stripped out the honey and vanilla and replaced it with a bit of coconut oil. They come out really nicely and make for great sandwich bread, or hamburger buns as well. However, the idea of adding spinach into the mix is a pretty great one. I’ll definitely have to try that. I came up with almost the same recipe as a transition food back when I became primal. If using for a burger bun, I find portobello mushrooms a whole lot more convenient if you can spend the money on them. I tried these today and yum! I used coconut flour rather than the shredded coconut, since I had it on hand. I found I had to add a touch of water (coconut flour absorbs moisture REALLY well), but otherwise, no other changes. I enjoyed a salami, tomato, and lettuce sandwich! Yum! What I dont comprehend is how youre not even a lot a lot more popular than you may well be now. Youre just so intelligent. You know so significantly about this topic, developed me take into account it from so quite a few diverse angles. Its like men and women arent interested unless it has some thing to accomplish with Lady Gaga! Your stuffs wonderful. Continue to maintain it up! The number one thing I miss all the time, is sandwiches. Oh how I miss them. I will be giving these a try, believe me! Thank you for the great idea. BTW, I added you to my blog roll. I wonder if you could substitute pumpkin by weight for the spinach, maybe with some cinnamon and nutmeg? What a fabulous way to use up spinach, too! Like some of the others, we feel SO much better without grains in our diet, and barely miss them, thanks to ingenious recipes like this! Oh how phenomenal! I am so trying this recipe. I just started converting my kids over to primal and with a husband who isn’t primal, that’s tough to say the least. They really miss pancakes… this will not only make it easier for me to make some but will help the veg intake as well. Awesome post, thank you!